Hello, everybody. So you may or may not be familiar with the Fire Emblem: Ascension thing I've been doing in Written Works. Well, now I'm going to try turning it into a playable SRPG Studio game called Sanctaea Chronicles! I intend to submit a demo with the first three chapters for this year's FEE3 (if I can find out how to send it to Arch), then create a more complete version with a few more chapters that will be available for everyone else to download. 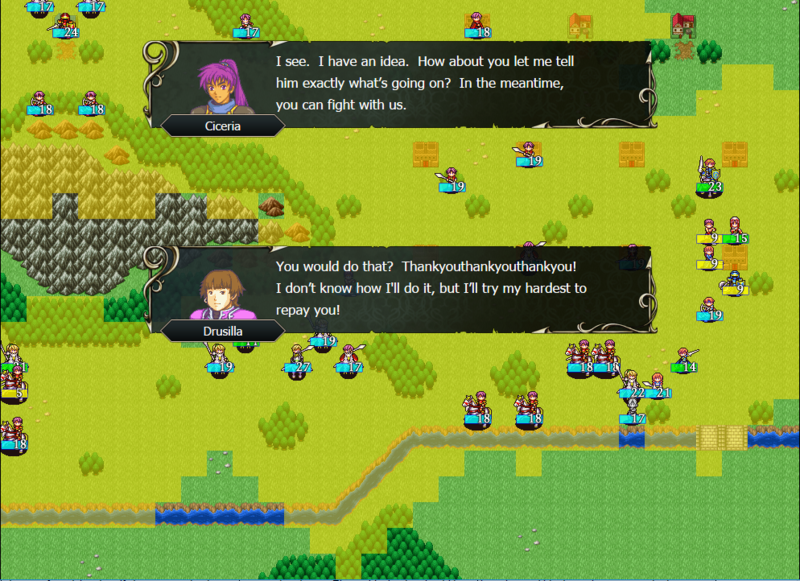 Story is now playable up to and including Chapter 7. Technically this is true, but there's a problem with Chapter 5 that makes it very hard if not impossible to proceed further. WLv in general has been adjusted to be less restrictive. Derrick and Bill’s retire/death quotes have been changed slightly. Bill’s base Def has been reduced by 1 and his Lck growth rate has been reduced from 45% to 35%. 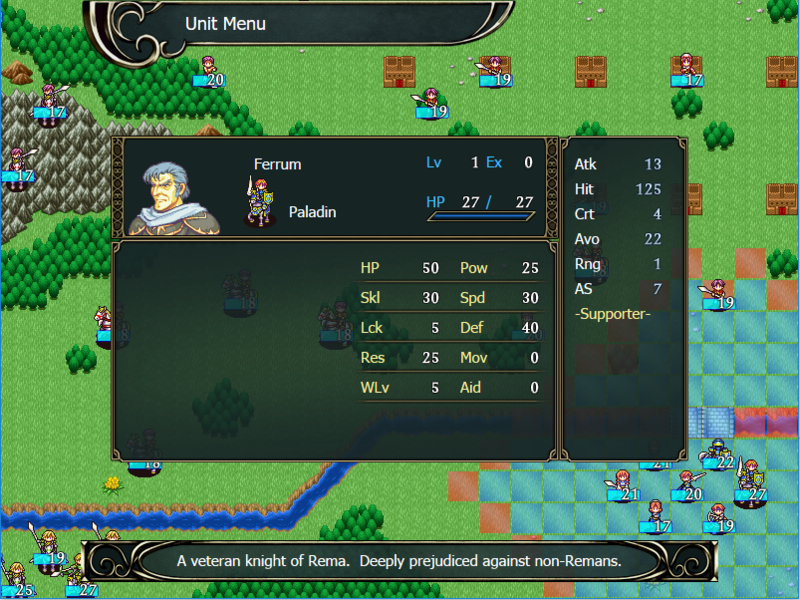 Several weapons and Skills have been renamed to not use Fire Emblem names. A new enemy-only Skill, Arrow Guard, has been added. It halves damage from Bows and is mainly used by bosses that can’t use Bows themselves. Boss music has now been properly implemented. Error with Chapter 5 opening fixed. Minor rewrites to openings of Chapters 1 and 3 to reduce uses of the word "brother". Vincenzo's base Spd has been increased by 1. Marcela's base Str and Spd have been increased by 1 and her base Def has been increased by 2. Flavor text has been added to all weapons and items. The Seraph Robe's max HP boost has been decreased by 1. Chapter 5's ending has been fixed. Weapon prices have been changed. Most are more expensive, but a few are less expensive. Ronstadt now drops 50000G when defeated instead of 30000G. The Thief that tries to pilfer the Chest is now labelled as "Ruffian"
(9/26/2018): Name of project changed from Fire Emblem: Ascension to Sanctaea Chronicles. See this thread for details. (10/15/2018): Spreadsheets of game info now available. (10/24/2018): Link to project's FEUniverse thread added. (10/30/2018): v1.0 publicly released. Changelog added as well. (11/1/2018): Warning added to changelog indicating problem to be fixed later. v1.0.1 publicly released. (1/20/2019): v2.0 publicly released, link to project's Discord server added. Looks interesting, especially the portraits look pretty good so far! Since I'm also interested in other SRPG Engine games and maybe trying it out myself; is there no way to change the formula to something more like Truehit? If there is, I don't know how to do it. I also don't particularly like being lied to about my hit rates. Arch has extended the FEE3 submission deadline to October 14th, which hopefully means I should have enough time to add another chapter with Carol to the demo if I can catch up sufficiently on my schoolwork. To make a long story short, the name of the project will be changed in an effort to reduce my chances of getting an unwanted cease-and-desist order from Nintendo. 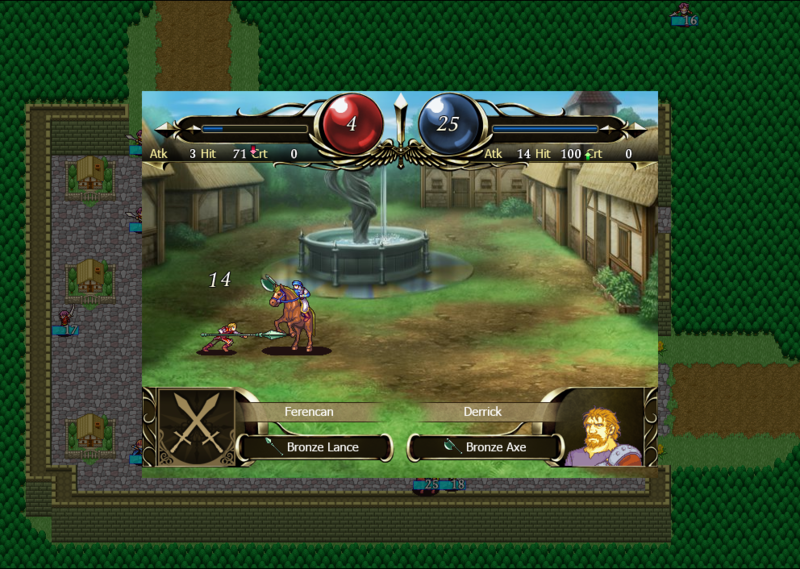 overall it looks fine, and it also reminds me a bit of Vestaria Saga due to similar graphics. seems like a legit old-school srpg to me, good luck with your project. 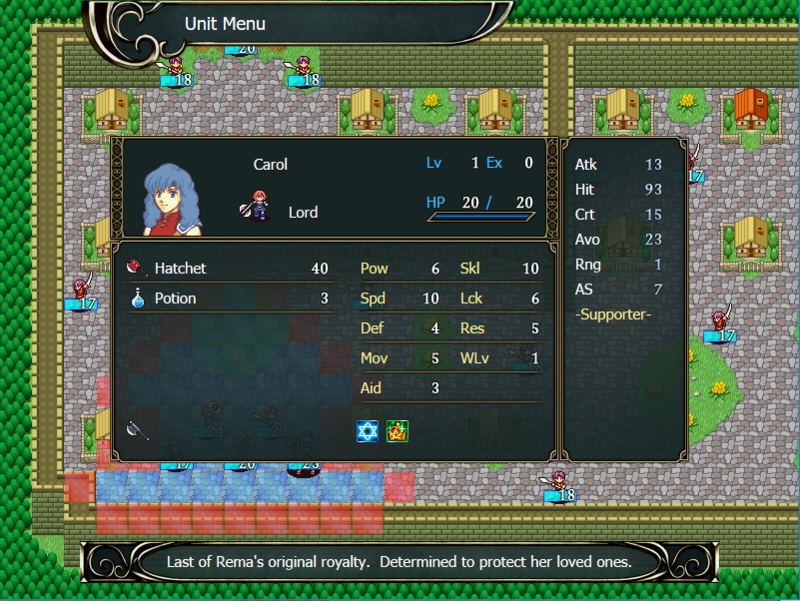 This is because Vestaria Saga seems to use a lot of SRPG Studio's default graphics, as does this game. Thanks. I have the intro to Chapter 4 done, but have not been able to start work on the map itself due to intense schoolwork. I hope we can have a playable demo. This look fantastic by the way. Well, gang, I've just submitted a Dropbox link with the necessary files to Arch. Hopefully that means we'll get to see Mekkah unveil it to everyone! Taking into account the deadline extension, I don't expect to see the game shown off at FEE3 until sometime in November, so I may be able to add a few more chapters to the publicly released demo and complete the first story arc by then. Nope. This game has a strict "no dragon loli" policy. The only thing you're going to see resembling a Manakete in any way is a dragon enemy Carol fights in a dream sequence. Aww man not all manaketes are lolis look at Nagi. I know, but Manaketes are still kind of cliché and I would rather not use them if I don't need to. Yes, she is supposed to be bald. We are confirmed for FEE3. I repeat, we are confirmed for FEE3. And Mekkah is going to be playing it. So excited! My plan is to release the public demo immediately after I watch his video. I would like to have it playable up to and including Chapter 7, though I may be a bit late after having hit a snag regarding Supports. Because SRPG Studio's default status window only accommodates up to 5 Support partners, I had to go back and impose a limit on how many Support partners a unit can have in any given playthrough of the game. In addition, I decided to make it so that no unit has more than 8 Support partners to choose from. 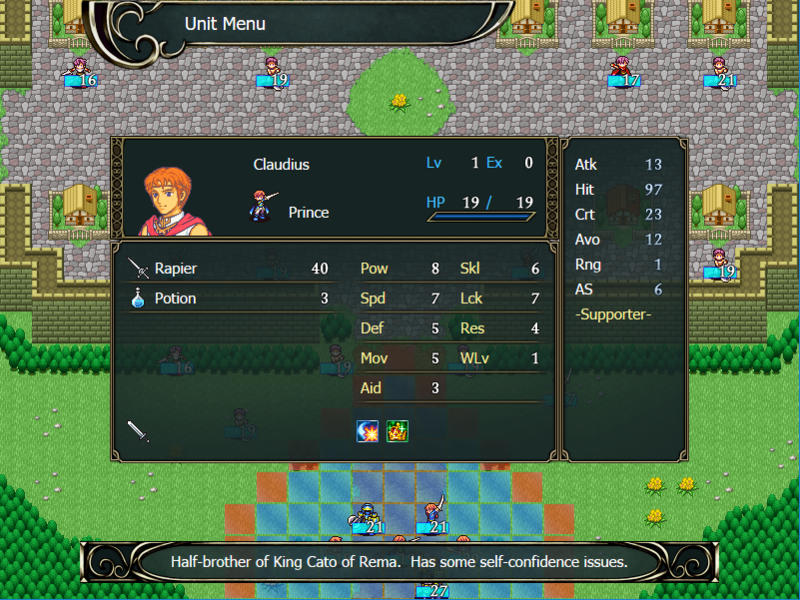 A character can reach Support Rank A with all of his/her partners, though he/she can only have a single S-Support. Most characters have 3 possible S-Supports and 5 other Supports. I was hoping to implement both Dougall and Boudicca (the Chapter 5 bosses) as playable characters last weekend, but because of the aforementioned Support snag, I was only able to implement Dougall. Before I can consider the demo ready for the public, I need to implement Boudicca as a playable character, finish the first Interlude, make Chapter 7, and playtest all of that. In the meantime, I'll go ahead and put up spreadsheets of characters, classes, Skills, Supports, and weapons/items for you all to look at. We're scheduled for Day 4 of FEE3 this year. So I guess the playable demo will come out on Tuesday. Hey, gang! v1.0 is finally here for you all to play! It doesn't have Support conversations other than Claudius and Carol's C-Support, though. I'll probably put those in a future revision, among other things. If you have any ideas for Support chains (refer to the Supports spreadsheet for ones I plan to include), please PM me and if I like what I see, I'll add it and give you a contributor's credit. Somehow the opening events of Chapter 5 got messed up so that Cato turns into Claudius and is unable to kill Duncan like he should, making the chapter pretty much unplayable. So I guess you'll only be able to play up to Chapter 4 right now. I'm going to need to fix that ASAP. I've fixed the problem and also made some other minor changes. Enjoy! Thanks for giving my game a try! I did try to use some custom scripts from the Japanese SRPG Studio Wiki, but I couldn't get them to work the way I wanted. For example, Petricia originally had Astra, which was supposed to function like it does in the 3DS games, but it ended up halving her Attack even when the Skill didn't trigger. I don't really see a need to change how the Level Up display works, since it's functional the way it is, but maybe stats increasing one at a time will make it easier to see what you've gained? I dunno. Maybe if enough people ask for it I'll put it in. By the way, how far into it have you played currently?